Carpe Diem Maldives Pvt. Ltd. fleet is recognised as one of the best dive liveaboards in the world by readers of DIVE Magazine UK for the second year running. Surrounded 99% by crystal clear water, The Maldives is considered to be one of the leading dive destinations, recognised by the numerous travel accolades around the world. 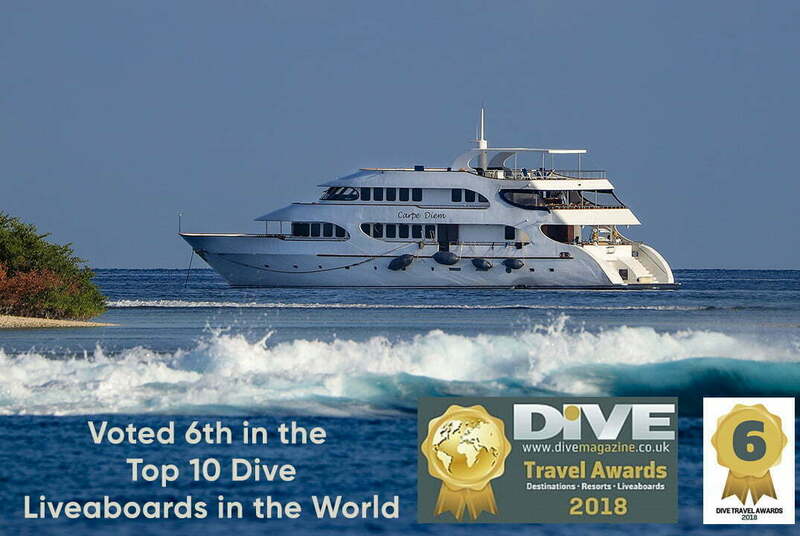 At this year’s DEMA dive travel fair in the USA, Dive Magazine announced the Top 10 Dive Liveaboards in the World 2018. All three liveaboard vessels in the Carpe Diem Cruises fleet were shortlisted in the final 25, with the first boat, Carpe Diem, being placed highest in 6th place. The awards are endorsed by readers and general public voting, and as the only Maldives liveaboard operator to receive the accolade for two consecutive years, Carpe Diem Cruises has become known as the ‘must-go-to’ dive safari operator for any novice or serious diver planning on visiting the Maldives. Since 2008, Carpe Diem Maldives Pvt. Ltd. has been growing to create dive and surf experiences with the mission of experiencing the excitement and anticipation of the Maldivian waters. From the first boat, Carpe Diem, the fleet has grown to become a collection of three luxury liveaboard dive and surf cruises, serviced by three teams of passionately dedicated crew. Carpe Diem Cruises are the only liveaboard operator in the Maldives to offer diving adventures with all-Maldivian Dive Masters. “When we began our dive safaris with the Carpe Diem vessel in 2008, this sector of tourism was still quite young and undeveloped in this destination. I am delighted that our boats have been acknowledged with this global award for two consecutive years, giving recognition also to the local boat building industry. 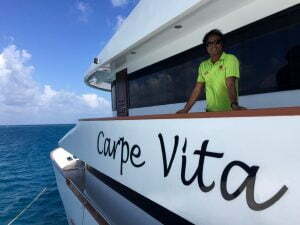 Carpe Diem, Carpe Vita and Carpe Novo were all designed and built at our shipyard on Innamaadhoo in Raa Atoll, with the specific intention of catering to the growing diving and surfing tourism sectors,” says Amir Mansoor, Managing Director of Carpe Diem Maldives. The company name is Latin for “Seize the day” and for Carpe Diem Cruises it is with the intention of experiencing the thrill and natural beauty of diving underwater in one of the world’s best scuba diving destinations. Year round, the Maldives has an abundance of dive sites with one inspiring dive encounter after another. For travellers who are on a mission to live life to the full, seek the exceptional, thrive in the new, and in equal measure, enjoy the comforts of a little luxury while you discover everything this Indian Ocean destination has to offer, then Carpe Diem Cruises offers this in abundance. With the native knowledge of Carpe Diem Cruises local dive masters and guides, guests immerse themselves in beautiful shoals of butterflyfish and oriental sweetlips, drift into the deep blue with white tips, hammerheads, manta rays and whale sharks, ride the currents along coral-filled overhangs with eagle rays, napoleon wrasse and blue marlin, or spot an octopus amidst the rocks. Each of the three vessels has 10-12 cabins, cater for a 20-22 guests, who can also enjoy the time onboard snorkelling, paddle boarding or simply relaxing on the top deck when not diving. Each cruise is a PADI certified dive centre and offers diving courses from novice to advanced and specialty skills. Offering year-round cruises, the itineraries cover central atolls, routes to the south and crossing the equator, as well as to the north where lesser known dives sites offer unique encounters with the underwater world. Carpe Diem Maldives Pvt. Ltd.
Facebook: Carpe Diem Maldives Pvt. Ltd.